Fulfillment center security is serious business when it comes to protecting the goods of our clients. At a2b Fulfillment we take a multi-layered approach to ensuring that the goods entrusted to us are safe and secure. So, you may be wondering, how do we do it? Let’s start by looking from the outside in. Think of the building as a fortress. Easy to defend. Hard to attack. Layers of defenses provide the fulfillment center security you need to protect goods from theft. Fencing and gates are essential to providing outside security. Limiting the number of access points to our property and buildings is critical. All entry into the building is controlled by an access control system. Outdoor lighting. What can’t be seen presents an opportunity for foul play. We keep the exterior and grounds well lit. Also, there is nothing that blocks a clear view of the building such as heavy vegetation or piles of pallets. The truck entrance can be opened only by activation from within. This requires drivers to contact the Receiving Department. This becomes a solid check because Receiving knows who is expected. So any surprise visit by a truck immediately triggers multiple levels of scrutiny. Surveillance cameras and alarm systems are necessary. Video is constantly monitored and predefined event alerts are sent to management as they occur. We have already mentioned access control cards for entry into the building. Now we carry that one step further. Each employee is restricted only to the areas of their job. For example, most administrative personnel do not enter the warehouse. Warehouse people enter only the areas they are assigned to. Agents in our Contact Center only access that defined area. All areas are time controlled so that personnel with lower credentials can only enter during work hours where supervision is present. Temperature control sensors are utilized in our climate controlled warehouse ensuring that the desired conditions are always met. Fire Suppression Sprinkler systems are in place to quickly address a situation should a fire occur. The best thing that any business can do for improving security is to hire the right people. At a2b Fulfillment, nearly all of our employees are full time. We do not use temporary labor giving us ultimate knowledge and control of who works within our facilities. We run a rigorous screening process checking everything from previous employment, criminal background and drug screening. a2b is a certified Drug Free Workplace. All of the above actions are great in themselves. But without good business processes, all that can be undermined. To protect inventory, good practices are essential. That starts with good inventory control. When goods are received, thorough screening is necessary. Are the counts correct? Are the items what they are supposed to be? Quality control in pick, pack and ship processes ensure that orders are fulfilled correctly. That reflects back to good inventory management. Good records, in and out, lead to inventory counts that are improved dramatically by doing it right the first time. At a2b Fulfilment, we have a full time staff responsible for inventory management. That speaks volumes that we are serious about making it as perfect as possible. The responsibilities for our inventory control managers include monitoring all systems and procedures such as inventory receipt and put-away, inventory transfer from storage to pick and pack areas, quality control for pick and pack and inventory counts. Constant monitoring, evaluating and assessing are essential to improve quality control. 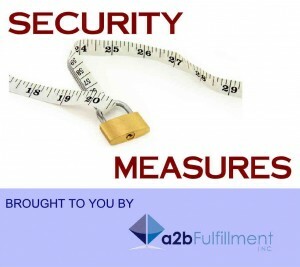 In addition, a2b employs many additional methods of fulfillment center security that we cannot disclose in this post. Rest assured, we are on the case. If you have ever had a worry about the security of your products, now is good time to speak with a2b Fulfillment.